The water sometimes can contain elevated levels of mineral ions, mostly calcium and magnesium, which makes the water hard. This has a negative effect on the plumbing system, will make your skin and hair dry and makes it difficult to form lather with soap. Travelers who spend a lot of time on the road, the RV travelers, may face these problems as well. Water softeners will reduce these mineral ions in the water, thus reducing some of these negative effects. After much searching, we conclude that the best RV water softener for most people is the Watts RV PRO-1000 OR M7002 10000 Grains Portable Water Softener. The Watts RV PRO-1000 has a 10,000 grain capacity and the custom-designed flow valve allows the softener to be regenerated with salt without you needing to disconnect and then re-connect the system. The Watts RV PRO-1000 is capable of providing very high flow rates of 4 gallons per minute without there being much drop in pressure. And the unit is very compact and mobile, with its weight at 24 pounds, and having a diameter of 9 ” and a height of 21′. If you are willing to spend some more, then you can pick up On The Go OTG4-DBLSOFT-Portable 16,000 Grain RV Water Softener. This Double Standard Softener & Conditioner is capable of producing twice the amount of water as can be obtained from a standard model. This unit can supply up to 40% more soft water than any other unit on the market, needs just two boxes of common salt to regenerate in under 30 minutes, and can provide you with up to 1600 gallons of soft water or up to 40 days. If you do not want to spend that much money in obtaining a portable water softener for your RV, then you can go with Portable 16,000 Grain Mobile-soft-water Unit. The water softener unit is easy to use and has a 16,000 grain capacity of removing hardness from water. 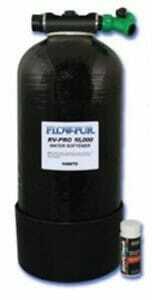 The water softener can also remove soluble iron from the hard water. The water connections that are used in this unit are free from lead, thus removing any chances of you being contaminated with lead. As has been explained before, the classification between hard and soft water is dependent on the presence, or absence, of two highly soluble minerals, calcium and magnesium. These minerals have no adverse effect on the human body; to the contrary, these are part of the essential daily nutrients that the body needs. The problems that these minerals create lie elsewhere. Both of these minerals can form a deposit on the surfaces that they come in contact with, which may be in the plumbing, or your water heater, or decrease the effectiveness of soaps and detergents. According to an article on water softening the hardness in water is measured using one of two units. The first one is the parts per million (ppm) of calcium carbonate, which is equivalent to the concentration of dissolved magnesium and calcium. One ppm means that one unit of calcium carbonate is dissolved in one million units of water, which can also be equated to milligrams/liter (mg/l). The second expression that is used to measure hardness is grains per gallon (gpg) of calcium carbonate and this equals approximately 17 mg/l or ppm. The amount of magnesium and calcium present in the water can be reduced by the process known as ion exchange. A physical and chemical process filters the water through an exchange media known as resin or zeolite, which typically is either a synthetic material or a natural sand-like material that is coated with positively-charged sodium ions. In water, the magnesium and calcium dissolves to form positively charged ions and the environment for the exchange of ions is created. When the water flows over the resin, it releases the sodium ions, which are readily traded for the magnesium and calcium ions. Hence the water that flows out is free of the calcium and magnesium ions, and is considered soft. Obviously the resin will not soften water indefinitely, there will come a point in time when all the sodium ions present on the resin will be expended, and the resin will no longer soften water. When this point is reached, the water softener will need to be run on an alternate cycle called regeneration. During this process, the resin is backwashed with a salt solution. The brine will not only replenish the sodium ions on the resin, but also take out the calcium and magnesium ions that may have been deposited. On completion, the water softener is ready for business again. Some water softeners will automatically switch to this process once it detects the low amount of sodium ions, in others the process has to be initiated manually. As has been mentioned before, hard water will wreak havoc on the plumbing and will waste soap. According to an online publication from the College of Agriculture at the University of Kentucky minerals that cause hardness in water will create lots of problem for household appliances. Hard water will cause problems in almost every cleaning task that you might undertake, from laundering and dishwashing to bathing and personal grooming. Clothes that have been washed in hard water will look dingy and will feel very harsh and scratchy, hard water will cause the utensils to have spots on them and hard water will leave a residue on glass shower doors, shower walls and bathtubs. Hair that is washed in hard water will feel sticky and look dull. The performance on household appliances has been documented by some researchers at the University of New Mexico. The one-year study measured the energy consumption of six gas and electric water heaters in Las Cruces, New Mexico that have been in use from five to fifteen years. Half of each group used the untreated water present in the area which is hard. The other half exclusively used softened water. The results of the study showed that the heaters that were using hard water consumed more energy than the ones using softened water. This is not surprising because the accumulated scale is a poor conductor of heat. Soft water is not without its problems, however. The calcium and magnesium ions that are dissolved in the water is what imparts a taste to the water, which some people like. According to an article on the risks of softened water there are some other more serious problems of using softened water. Soft water has a high sodium content, so it is bad for the plants once it starts accumulating in the soil, as it would not allow the plants to take in water and the plants would die of thirst. The extra sodium content is also not good for the lake or sea environment if the excess soft water is deposited there. If you suspect that you are not getting soft water, according to Plumbing Professors the first thing you should do is to check the control settings of the water softener system. Most of the softeners have an electronic control system that lets you set the time and duration of the ‘backwash’ cycle. So before you do anything else, you should check that the system is powered and the clock timer is set properly. The best time to do so is early in the morning when no one will be using the water. If that did not solve the problem, the next step is to check for problems in the unit that supplies salt to the softener. Salt will sometimes ‘bridge’ in the salt tank which happens when salt does not dissolve in the brine tank, which means that the resin is not getting cleaned as thoroughly as it should be, the end result being that the water that is coming out of the system is still hard. You can take a broom handle and push inside the tank. If a salt ‘bridge’ or ‘dome’ was present, it would cave onto itself. You can wait a day or two to see if the water coming out is now soft. If there was no salt ‘bridge’ or ‘dome’ the brine tank should be emptied of all the salt, paying close attention once you reach the bottom of the tank. A normally functioning system will only have some dirt and grime at the bottom. Instead if you have some mushy substance as the residue, that may be the problem. Once you have cleaned the substance, which is nothing but salt that has not dissolved in the water, make sure that you clean the tubes as well. If this does not solve your problem, then the resin inside the water softener unit probably needs cleaning. You would have to follow the instruction manual supplied by the manufacturer in order to do this properly. If the problem still persists, it is probably a good idea at this point to let a professional person handle this, unless you are comfortable working around electricity, gears, timers and pumps. The functioning of the Watts RV PRO-1000 Water Softener is very systematic and quite simple. The water softener unit measures 21 ‘ 9.5 ‘ 9 inches and weighs just 9 pounds which makes the unit quite capable to be carried around easily. The unit softens the water by absorbing heavy metal ions like calcium, magnesium and iron in the resin tank. The portable water softener unit utilizes a digital controlling system panel which will allow you to adjust the system according to your utility purpose. The system can work according to your needs. You can turn the system off when you are not using it, thus increasing the useful life of the resin inside the water softener unit. The Watts RV PRO-1000 is quite easy to set up. It has no moving parts and uses no electricity to operate. The water softener unit has been designed with brass and stainless steel fittings which mean that the unit does not require much in the way of maintenance. The 10,000 grain capacity of the water softener unit enables the unit to soften up to 5000 gallons of water before the resin needs to be recharged, and during the water softening period, the water pressure remains constant. The regenerating process uses 2 pounds of sodium chloride, which is the normal table salt that is available everywhere, and the regenerating process for the resin takes just 20 minutes to complete. This means that you do not need to carry around any specialist salt with you when you are enjoying your time in your RV, which is definitely very convenient and one less thing to worry about on your road trip. When you are done with using this system, it is very easy to empty it and store in compartments. This unit will be of great service to the users who have a bit of knowledge on how a portable water softener works, and what the difference is between a whole house system and a portable system meant to be used in an RV, for example. The whole house system utilizes an automatic system of recharging the resin, while in the portable system, everything has to be carried out manually. If you see the ‘Y’ valve breaking, this is due to the very high water pressure that can be found in RV parks, with pressure reaching 80 psi rather than the recommended 45-55 psi, which can be definitely be damaging for the plastic ‘Y’ valve as it is not rated to carry such pressure. We would suggest buying a pressure reducer and set it upstream of the tank. The more hard water you run through the softener, the less water you can soften before the unit will need to be regenerated. But if you regenerate the unit regularly, the water softener unit will perform like a top line unit. The OTG4-DBLSOFT-Portable RV Water Softener is quite easy to use and provides a soft water supply of 10-32 days before the system needs to be regenerated. The unit has a height of 22 inches and a diameter of 10 inches and has a weight of 32 pounds when empty, so the water softening system is not too difficult to carry around. The OTG4-DBLSOFT provides 40% more softened water than the next leading brand of portable water softeners available on the market today. The water softener resin can regenerate with just two boxes of common table salt, or with potassium chloride, in less than 30 minutes. The system is capable of providing up to 1600 gallons of soft water, or can provide the softening service for 40 days, before the resin needs to be recharged. The system has a handle on the top, which makes it very easy to carry this unit to different places. It has a large opening at the top, which would make it easy for you to add salt when the system needs to be recharged. There is a cap-and-plug option which prevents leakage when you are on the road and has been built for quick and easy regeneration. The resin used in this system is of a high grade and the 360 degree swivel allows for an easy connection to the faucets in the RV parks and requires no tools or electricity to operate. The inlet high-flow shut-off control valve allows a very slow rinse which results in a better quality of soft water. There is even a back-flush adapter included which can be used for a quick reverse connection when required. We were very happy with the general performance of this system. We tested this on hard water, where the reading came out to be 250 ppm, which is indicative of hard water. After we installed the system and performed a 5 minute flush, we repeated the test on the water coming in the RV, and the hardness reading of the water practically came to 0. In fact, the color of the test strip that he used on the soft water came out to be lighter than the lowest shade of the strips provided on the comparison bottles. We also witnessed a drop in hardness readings from 140 ppm to below 40 ppm after installing and using this system to soften the water coming into his RV. However the plastic hose fittings on this system is not very strong, especially if the unit tips over. The 16,000 grain portable water softener manufactured by 602ABCWater has its fittings made from brass garden hose and not from plastic like the water softener units from other manufacturers. This allows the unit to be used in situations which calls for rugged use of the system. The resin used in this water softening system has a high capacity of 16,000 grains, and the system is capable of regenerating in minutes with the use of regular table salt. The system is able to soften up to 2000 gallons of water before the resin needs to be recharged. The system comes with a handy handle on the top which makes it very easy for the user to carry it to different places. The Portable Water Softener system measures 10 inches in diameter and 18 inches in height which makes it quite easy to store the system, and the handle at the top makes it very easy to carry around. Customers in general were very contented with the way the water softener system has performed for them. One customer has written of his experience of using the water softening system for 5 months in his RV, while he was staying in the RV full time. When he received the unit, the in/out fittings were installed opposite to the way that they should have been. After the customer corrected this, the system started working fine, and he managed to get about 2000 gallons of water or about 3-4 months’ worth of water for someone living full time. The customer said that the 16,000 grain unit is a little too heavy at 40 pounds to be lugging around everywhere, and he would have preferred the smaller 8,000 grain unit. Another customer was unhappy with the way the system was designed, making it impossible to tighten up the screws enough to stop the unit from leaking. The Mobile-soft-water Portable 16,000 Grain Unit is capable of removing calcium, magnesium, iron, lead, radium and other heavy metals that can be found in the well or in the water supplied by some municipality. The system measures 9 inches in diameter and 18 inches in height and has a garden in/out connection. The unit weighs 32 pounds. The water softening system can treat supply water with a total hardness of up to 10 gpg flowing at a rate of up to 5 gallons per minute and make the hardness of the water come down to 0 on a continuous basis. The system can soften up to 1600 gallons of water before the resin needs to be recharged. The water softener vessel present inside the tank is made out of fiberglass reinforced plastic, and the pressure vessel is able to withstand an operating pressure of up to 150 psi. Both the water inlet and outlet connections are made out of Nylon and not lead. To enhance the mobility of the water softening system, each of the male hose connections are capped. The tank is loaded with a ‘ cubic foot of highly charged water softening resin which has a high capacity of 16,000 grains. The manufacturer has replaced the brass fittings on their water softening system with nylon fittings in line with USEPA mandate that states that any connection that has a possibility of being used in drinking water application has to be free of lead. The OTG3-NTP-3M Portable Water Softener is an easy to use unit that is capable of providing soft water for 7-14 days and costs only pennies a day to operate. The tank has a diameter of 6 ‘ inches, a height of 22 inches and weighs 18 pounds, the compact dimensions and its lightweight making it a very portable system. The system can soften 300 to 700 gallons of water before it needs to be recharged. The OTG3-NTP-3M is capable of recharging with just one box of common salt in 15 minutes. The manufacturer includes test strips that can be used to test for the hardness of the water, caps that can be put on the inlet and outlet valves when the tank is being stored, a shut-off valve when there is a high flow of water in the inlet pipe, hose adapters for the inlet and outlet valves and a 4’ high pressure white drinking hose. The customers who have reviewed the OTG3-NTP-3M Portable Water Softener were very pleased with its performance, with one customer suggesting to other potential customers that if they are on the edge of the fence about buying this particular portable water softener system, then they should not think twice and just go ahead and buy the unit. Another customer has tested the water before and after using the system in a campground where the water is very hard, and he has had amazing results. The Mobile-Soft-Water Portable Softener has the capacity of 3,200 grains, which is a nominal value. The tank has a diameter of 6 inches and a height of 15 5/8 inches. The tank weighs just 14 pounds which makes it a very portable system. Its compact size also allows it to be stored in tight spaces inside your RV. The tank has 0.1 cubic foot of highly charged resin, which allows for very efficient softening of water. The system can soften up to 320 gallons of water with a hardness level of 10 gpg down to 0. The flow rate of the supply water can be as high as 5 gallons per minute. When the resin needs to regenerated, it can be done without using electricity. The water softening vessel inside the tank is 6 inches in diameter, and is made out of fiberglass reinforced plastic which means it can withstand water pressure of up to 150 psi. The fittings inside the tank are made out of NSF (National Sanitary Foundation) listed material, which means that you can safely drink the water coming out of this system. One customer who has reviewed this water softening system was very pleased with the way the system has performed. He was in a RV park that had hard water. After he has installed this system, the quality of water that he used improved a lot. He even praised the customer service of the manufacturing company. He had a minor issue with the Portable Softener, and the customer support could walk him through the issue. The OTG4-StdSoft RV Water Softener has a diameter of 6.75 inches and a height of 22 inches and weighs 18 pounds, making it a very compact water softener system. The standard softener has the fast hook-up feature which will allow you to quickly set the system up and have it running in no time. The tank also has a carry-on handle which will allow you to easily carry the water softener system around. The tank has a large mouth opening which enables you to easily add salt to the tank when it needs to be regenerated. The water softening system can soften water for up to 20 days, before it needs to be regenerated, which can be done using a box of table salt in 15 minutes. The 8,000 grain water softener system will make a perfect fit for the RV as it has been designed for the RV. Its compact design allows you to easily store it in your locker when you are not using it. Customers who have reviewed this product on Amazon have been greatly impressed with the performance of this product, with one customer having a minor complaint that the fittings at the top of the tank could be made stronger. The 12,800 grain water softener manufactured by 602ABCWater can recharge in 15 minutes when two boxes of common salt is added to it. You can typically soften between 1500 and 2000 gallons of water between recharging the system. The manufacturer includes testing strips with the water softening system which you can use to test the hardness of the supply water, and see the difference in hardness once you have set up the water softener system and have used in on the hard water to soften it. The tank comes in different colors, if you have a certain color preference, all you have to do is pick up the phone and call the manufacturer. The tank now comes with a custom handle on top which would make it easier for you to carry the water softening system around. The Park Model Portable RV Water Softener has a huge capacity of 32,000 grains, making it one of the largest capacity of portable RV water softeners available in the market today. The water softener system requires no tools or electricity to operate. The system can provide 1280-3200 gallons of soft water before the system will need to be regenerated. The Water Softener & Conditioner requires four boxes of common salt to complete the regeneration process. There is a high-flow shut-off control valve which will allow for a very slow rinse which results in improved water quality. Eddy Electronic Water Descaler uses complex electro-magnetic wave applied through two coils placed around the water supply pipe. The ever changing magnetic field produced by the coils alters the adhesion properties of the limescale so that it will no longer deposit itself on pipes. Since the electronic water descaler does not alter the hardness of the water, you can still get the beneficial effects on your health of calcium in the water. Hard water can have detrimental effect on the different appliances that you might use when you are travelling in your RV, and not to mention, it will make you feel uncomfortable by leaving you with bad hair and skin. Our top pick for the best RV water softener for most people is the Watts RV PRO-1000 OR M7002 10000 Grains Portable Water Softener. When you are using a portable water softening system, make sure that you keep track of the amount of time or water that you have softened using the system, so you have some idea as to when you would have to regenerate the unit; otherwise the water softening system will be unable to serve its purpose properly.